Franks Casket - Guest Contributions - Barthelmess, "Stranded Whales"
Guest Contributions - Barthelmess, "Stranded Whales"
The automatic translation is necessarily imprecise. This translation does not replace the reading of German or English original texts. The Japanese word "isana" is a perfect rendition of what we now call the psychological archtype of the "Great Fish", which in all maritime cultures is represented by the whale - analogous with the "Great Bird" or the "Great Land Animal", which in other societies may be represented by the eagle, condor, elephant, buffalo, bear, tiger, etc. Throughout history, all these animals have not only been the object of spiritual veneration, but also of material exploitation. Whenever such a Great animal by chance became available, the awe it inspired did not prevent humans from scavenging its big body for useful materials. Whereas the consumed protein resources from a stranded whale did not leave traces in history, both the material and the spiritual culture it inspired, have. The earliest example of European poetry about a stranded whale is an Anglo-Saxon inscription on a whale bone casket of about 700 AD. The material is properly identified in Northumbrian runes: HRONSBAN, whale bone, and then follows the story of the beached whale and its plight. With some effort, experts of Anglo-Saxon culture have been able to discern an intricate system of runic magic in the inscriptions on this whale one casket. The explicit identification of the material strongly suggests, that magic properties were also attributed to whale bone. 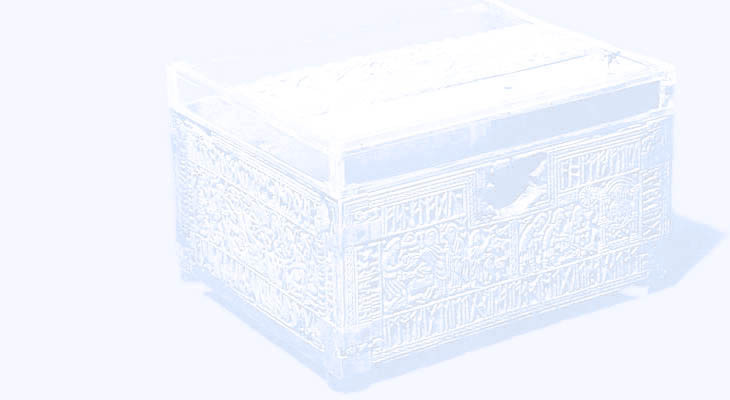 The high craftsmanship and the presumed magic aspects of material and inscription make it likely that the casket may have served as a container for precious gifts dealt out by a laird or warlord to his vassals in ceremonies intended to shape strong bonds of allegiance, something of utmost importance in early Germanic societies. In his huge manuscipt about animals of ca. 1260 AD, Albert the Great provides for the earliest reference to a series of sperm whale strandings in the North Sea - where this species only occurrs erratically - in the 1250s. Promoted to the art of literature the greasy topic is again by medieval poet Jan van Heelu. In his rhymed chronicle of ca. 1290 he compares a military ambuscade with a whale that strayed too close to shore, finding itself eventually trapped by a net. Among the tosephot, a community of learned Jews in 12th/13th century France, it was discussed whether scaly, kosher fish found in the stomach of a whale - which is not a kosher animal - may be eaten by the abiding. From this it can be inferred that fish-eating, stranded rorqual whales were at the root of this academic religious debate. The order of nature, or in Christian faith, of God's creation, had assigned whales the watery element. When whales left their assigned element, i.e. became stranded, the order of the godly creation was infringed upon. In Christian medieval and early modern thought, people did not seek to investigate the reason for this disorder, but rather attempted to interpret the meaning of this event within the framework of the godly plan for human salvation. Thus - in spite of the unexpected windfall of valuable commodities that could be manufactured from their blubber, meat, bones, baleen or teeth - stranded whales were interpreted as a harbinger of evil fate, as a portent of bad luck, or a mean omen. At any rate, they were events worth recording for future generations. Thus, from about the end of the European middle ages, stranding records start to become gradually more frequent. Two large bones of whales that strayed into the Trave estuary, Baltic Sea, were suspended as a memorial outside Lubeck's ramparts in the 13th century. There is evidence for about 200 cases of whale bones hung in European churches, castles, and town halls - many of them now lost - which can be interpreted as "hierozoika", a Greek word designating items from the animal world hallowed by being mentioned in the bible. These bones mostly originated from stranded whales (a few from prehistoric, fewer still from large exotic animals), they were often interpreted as bones of the biblical giant Goliath or of Leviathan, and were sometimes traded long distances to be found hundreds of kilometers from the sea. Whale bones as "hierozoika" sanctioned political power of the church, feudal lords or municipal governments, and they were welcome diplomatic gifts between these institutions. In the country, landowners sometimes set up the paired jawbones of stranded baleen whales as arches in their gardens. Another way of recording whale strandings for posterity was painting the huge "fish" for display in the same type of buildings, i.e. churches, castles or town halls. We know such commemorative, "public" paintings of stranded whales from the Mediterranean all around Europe to the Baltic Sea, frequently executed in a monumental format between the 1430s and the 1830s. Many of them have been lost. A noteworthy, surviving example is a life-size "portrait" of a minke whale stranded in the Weser estuary in 1669, painted by a student of Rembrandt on a 3.70 x 9.40 m canvas. For three centuries it had hung in the town hall of Bremen, was discarded in the 1960s, luckily retrieved and after restoration is now on display in the German Maritime Museum in Bremerhaven (incidentally, the earliest realistic depiction of this species). The spread of the letterpress, invented in the 1450s, brought about another potential for recording noteworthy events - such as whale strandings - or rather, disseminating the news of them to a larger clientele, who were willing to pay up to half a day's income for a printed broadside or pamphlet. Usually illustrated by a spectacular woodcut or engraving, a typeset text told the pertaining news story, often in quite a dramatic style, for mountabanks peddled these imprints by yelling the stories to an illiterate audience on marketplaces and fairgrounds. The oldest pamphlets on stranded whales known so far date from the 1530s. In medieval Christian tradition, they continue to interpret the "meaning" of a whale stranding, but gradually over the centuries, the prodigious aspects step behind more empiric ones. Besides the "political profit" of displaying spectacularly big whale bones or huge commemorative paintings in public buildings, the commercial exhibition of entire mounted skeletons, of body parts in the flesh, or even entire carcasses of stranded whales, also has a long history in Europe. It started already in Antiquity. Bones from a whale stranded in present-day Israel were shipped to Rome to be set up for public edification by an organizer of circensic games in 58 BC. Another whale skeleton could be admired in 4th-century Carthage. In northern Europe, records of commercial exhibitions of whales set in in the 1450s. In 1549, duke Cosimo de Medici set up a sperm whale skeleton in a loggia of the Palazzo Vecchio of Florence (accompanied by a mural painting). The dried head and flukes of a sperm whale stranded near Antwerp in 1577 were transported on a cart over much of Flanders and Germany. Swiss entrepreneurs bought the skeleton of a fin whale stranded near Arles, France, in 1619. A unique broadside illustrates how the skeleton was set up in showrooms: the vertebrae were laid on two parallel poles, the ribs suspended perpendicularly, the jawbones laid on the floor, the skull hung by a pulley block from gallows or the ceiling, and the shoulder blades were mounted as a vertical tail fin. Town officials were sometimes bribed with souvenir bones from the whale, which explains the presence of "stray" whale vertebrae, ribs or flipper bones in town halls hundreds of kilometres from the sea, as well as decreasing measurements of the displayed skeleton in some updated editions of the pertaining broadside. Transport logistics having been solved early on, improved preservation methods brought about a real "boom" of commercial whale exhibitions in the 19th and 20th centuries. Some enterprizes had several whale carcasses on tour simultaneously, but these originated not from stranded animals, but from whales bought at whaling shore stations. Besides differences, scholars of Japanese culture will recognize a few similarities between European and Japanese ways of dealing with stranded isana, the Great Fish. The humpback whales stranded at Shinagawa in 1798, e.g., inspired ukiyo-e artists and poets for two generations. Some whale shrines had torii made of whale jawbones. One ban-woodcut by Yoshitoshi shows a commercial exhibition of a rorqual whale at Fukugawa in 1875. Following the recent paradigmatic change in contemporary western civilisation, whose dominantly metropolitan lifestyle has increasingly alienated it from nature, whale strandings now inspire a culture of public larmoyance. Awe and curiosity have given way to pity and a faddish environmental pessimism. Some western "whale huggers" even stricture children who - innocently seeking a little high ground above the adults - climb upon the carcass of a stranded whale! Such modern irrationality likewise is an expression of the perennial validity of the psychological archtype of the Great Fish. But unlike the irrationality of awe the Great Fish inspired in the past, permitting at the same time its material exploitation, the new western attitude is preemptive, dogmatic and intolerant. 1. 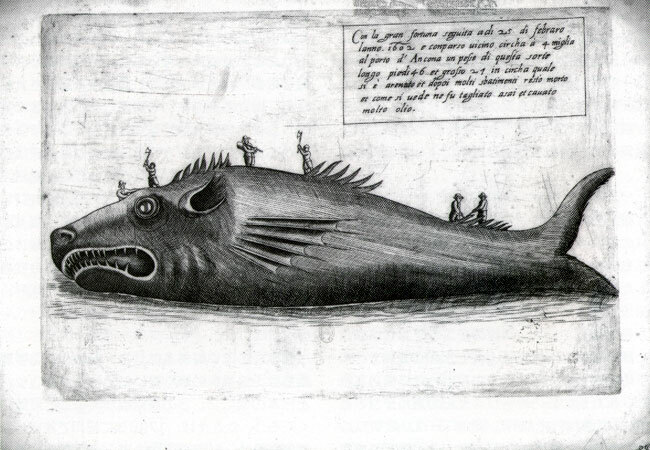 Italian broadside on the stranding of a 13.5 m whale near Ancona, Italy, on 25 February 1602. Engraving, 22.1 x 33.1 cm. This broadside was possibly sold by the owners of a travelling exhibit featuring the skeleton of this whale. Barthelmess Whaling Collection, No. 846. 2. 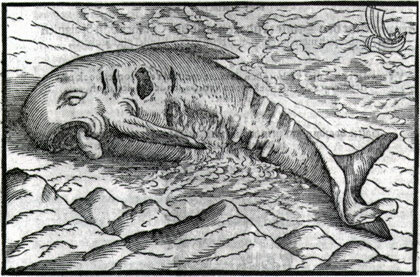 Fairly realistic woodcut illustration, 8.7 x 13.4 cm, of a half-rotten pilot whale washed ashore near Katwijk, Holland, on 20 September 1608. In the appertaining pamphlet the condition of the carcass is compared to a "rotting" peace treaty between the Netherlands and Spain. Barthelmess Whaling Collection, No. 241. This pamphlet and the previous broadside have been described in detail by Ingrid Faust, Klaus Barthelmess & Klaus Stopp: Zoologische Einblattdrucke und Flugschriften vor 1800. Vol. 4: Wale, Sirenen, Elefanten. Stuttgart: Hiersemann, 2002, which comprehensively catalogues 145 European broadsides and pamphlets about whales stranded between 1531 and 1792 (in German; ISBN 3-7772-0205-3). 3. 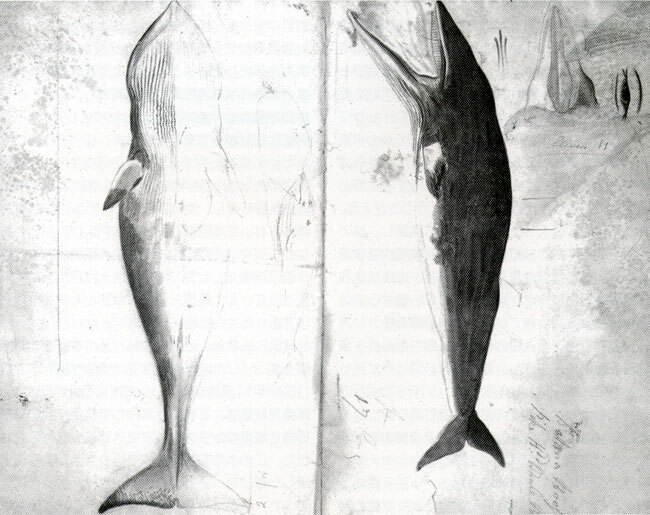 Minke whale found floating dead on the Doggerbank, North Sea, on 9 January 1787. Pencil and watercolour drawing by James Sowerby (1757-1822), ca. 25 x 23 cm. After examination by scientists like John Hunter and Sowerby, the 17-foot carcass was commercially exhibited at the Lyceum, Strand, London, from 29 January till around the 12 February 1787. This drawing is probably the second oldest depiction of this whale species. The dorsal fin had been cut off. Barthelmess Whaling Collection, No. 709. Guest Contributions Szabo, "Bad to the Bone?"